Where Have All the Peace Treaties Gone? The United States has been drawing down from two major military actions that have cost thousands of lives and trillions of dollars. But when the last US troops leave Afghanistan, all signs suggest that they will do so without a peace treaty. The absence of a peace treaty to conclude the Iraq and Afghanistan wars reflects a broader global trend. Why have states stopped using peace treaties as they end their wars with other states? The use of peace treaties in interstate war is in global decline. The proliferation of codified international humanitarian law has created disincentives for states to conclude formal peace treaties. If formal peace treaties are associated with longer-lasting peace, recent interstate wars that have ended without peace treaties may resume in the near future. The use of peace treaties to conclude civil wars appears to be on the rise. 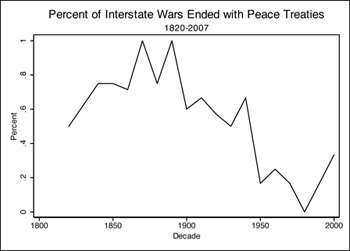 At the turn of the 20th century, nearly all interstate wars ended with peace treaties; today, fewer than half of interstate wars do. This dramatic shift is cause for concern, as scholarship has shown that wars ending in formal peace agreements are especially likely to be followed by a more durable peace. In a recent article in International Organization, I investigate this fundamental change in the way we end wars. Peace treaties have punctuated wars for millennia, but if the recent past is prologue, the current millennium is likely to see few such agreements forged between states. My findings show that the proliferation of the codified laws of war governing how belligerents may conduct themselves during a conflict has created real incentives for states to avoid admitting that they are in a state of war. States today must navigate a complex sea of international humanitarian law in prosecuting their wars. Decisions regarding treatment of prisoners of war, protection of cultural property and, most important, what and who constitute legitimate targets are subject to intense and constant legal scrutiny. The consequences of this scrutiny have become increasingly dire with liability and culpability clauses frequently written into new laws, as well as the creation of the International Criminal Court. The US formally signaled the close of the Iraq war by lowering its mission’s flag. But this gesture was a unilateral and symbolic one that is qualitatively distinct from concluding a peace treaty. Signing such a peace treaty with either Iraq or Afghanistan would constitute a clear admission that the US had been in a state of war and, consequently, that international humanitarian law applied unambiguously to US conduct in these conflicts. But the US failure to protect the National Museum of Iraq from looting was almost certainly a violation of the 1954 Hague Convention on the Protection of Cultural Property. Alleged al-Qaeda affiliates captured in Afghanistan were famously not accorded prisoner-of-war status under the Geneva Conventions. And civilian casualties–anticipated and unintended–abound. If the US were to be held to account, restitution would have to be paid, and US soldiers and political leaders could be charged with war crimes. Notwithstanding these violations, it is important to remember that the US made strenuous efforts to comply with the laws of war in these conflicts. The proliferation of laws, however, has raised the bar for compliance extremely high—indeed, so high that even the best-resourced military in the world cannot reach it. What if states could act as if they were not at war, and thus limit their liability? This elegant, if cynical, solution to the prospect of soldiers and political leaders being charged with war crimes has serious implications for how we think about, and label, war today. States no longer begin their wars with declarations of war, nor do they conclude them with peace treaties. Instead of calling wars “wars,” they are labeled “police actions,” “counterterrorism,” or “counterinsurgency.” This kind of intentional ambiguity is especially troubling at a time when new technologies, such as drones and cyber attacks, are fundamentally changing the ways in which states may use force to achieve their political aims. There is at least one piece of good news. Even though the use of peace treaties is declining in interstate wars, peace treaties are increasingly being used to conclude civil wars. Why this is so is not yet clear, but it could be that rebel groups are becoming more aware of the importance of playing to an international audience. Interestingly, in addition to angling for a seat at the peace table, rebel groups are employing several innovative means to signal their own capacity and willingness to comply with international humanitarian law. Various groups have invited the ICRC to monitor their behavior, signed Geneva Call’s deeds of commitment, and deposited their intentions to abide by the 1949 Geneva Conventions with the Red Cross. The contrast between state and rebel group engagement with international humanitarian law and peace treaties brings the issue of whether more law is a good thing into specific relief. Whether the trade-off between peace and compliance in one arena versus another is worth it requires additional analysis. Either way, the demise of peace treaties in interstate wars raises the question: in the absence of the formalities of war, how will we know if a war has really ended? 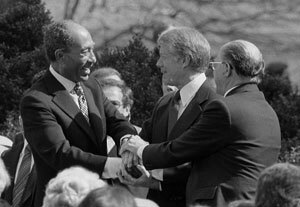 About the photo: President Jimmy Carter shakes hands with Egyptian President Anwar Sadat and Israeli Prime Minister Menachem Begin at the signing of the Egyptian-Israeli Peace Treaty on the grounds of the White House, March 26, 1979.